Consider joining a walking group, or participating in walking events, to get a few thousand extra steps in per day. The great thing about increasing your daily movement at this moderate yet eminently achievable pace is that you’re practically guaranteed to get positively psyched about addressing your health goals each and every day. Your overall stamina will improve, and you’ll probably find yourself sleeping better, as well. This moderate progression will surely lead to success in other areas as well, such as making better choices at meal time, or extending your cardio and resistance training time at the gym. For example, if you’re a software developer, writer, accountant, or attorney strapped to a desk; and sitting in meetings, cars, restaurants and on the sofa for 10 or more hours; you may be getting in only a couple of thousand steps per day. A good rule of thumb in this example is to allow yourself about three months to get to your optimal goal of 10,000 steps a day. 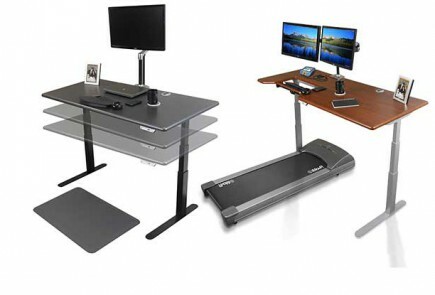 Using a treadmill desk for even just 2-3 hours a day can get you at least halfway to your goal without taking any time away from your day job. In fact, your productivity will improve just from pumping that much more oxygen to your brain, without even breaking a sweat. One mile is equivalent to about 2,000 steps, so if you can set your pace to, say, 1.5 miles per hour you can knock out half your daily goal in just 2-3 hours of use.